WINNERS FROM THE SEEKERVILLE ROCKIN' IT NEW YEAR'S EVE PARTY!!! Monday: We were closed for the Holiday - Happy New Year!! 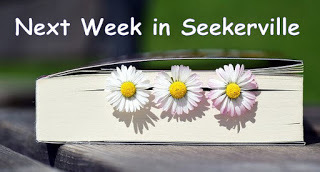 Tuesday: Mary Connealy welcomed in the New Year with a lot of new faces blogging here on Seekerville!!! The winner of a signed copy of the novella collection Hearts Entwined is Jennifer Hibdon! Wednesday: Amanda Barratt shared with us about Words Are Light. The winner of a copy of My Heart Belongs in Niagara Falls New York and of course, chocolate is Connie the librarian. Thursday: Cathy Gohlke came by to talk about craft and inspiration as she releases a beautiful new book "Until We Find Home". Winner of a copy is Jana Vanderslice! Friday: Audra Harders asked the questions "Where Have All The Words Gone?" The winner of an ebook by one of our new Seekerville bloggers - Melanie Dickerson, Jan Drexler, Winnie Griggs, Mindy Obenhaus, or Erica Vetsch - is Jackie Smith. Monday: Join Missy Tippens as we look at writing as a vocation. Do you feel God has called you to write (or to something else)? Come on over, and let's chat! Wednesday: Ruth Logan Herne rolls in to chat about writing a mystery... backwards! She's got some great advice for you whodunnit lovers out there, both writers and readers! And there's a copy of her first Guideposts mystery "A Light in the Darkness" being offered to one delightful commenter... to get you ready for the release of her second mystery "Swept Away"! Friday: Carrie Schmidt will be sharing with us today! You will not be seeing Ruthy anywhere this week except hunkered down, writing stories from her winter cave in Western New York... and here on Seekerville and over at Yankee Belle Cafe on Thursday where she's talking homemade pizza and football weekends! From Pam: Oh, I love this little bit of "Where's Waldo", Ruthy! I was thinking that I wasn't going to be anywhere, doing anything of import ... so boring. BUT that's not exactly true ... I'll be time-traveling back to the Natchez Territory in 1792. So, if folks need to find me, that's where I'll be this week. Check out these links for information and inspiration! Grammarphobia, just for the fun of it! Contest season has kicked off with a bang. Published contests open for entries are ACFW's Carol Awards (deadline March 15th) and FHL's Reader's Choice Awards (deadline March 1st). The ACFW Genesis Contest (deadline March 15th) for unpublished authors is also accepting entries. Winners, congratulations!!!! Send your info in and we'll get things organized for you when our hands thaw out!!! Audra, great WE, thank you!!! AND I CAN'T BELIEVE CONTESTS ARE BEGINNING SOON!!!! Another year begins!!! Holy Cannoli!!!! I just threw an eye on the WE through the week. It's the all the Seekers that make it happen! I'm so glad it's the weekend! Congratulations to all the winners! And thank you Seekers for my win. I'm preparing to see where God leads me this year (once the shoulder surgery is done). I'm excited about my one word - ENGAGE, and I am just plain excited to see where I'm being led through. May you all be blessed today and throughout the week. I love the word engage... it's a move forward word, with gentle strength attached. Go you!!! Cindy, I like that word. So many ways you can use it. Society as a whole has become so disengaged. Love your word, Cindy! Be sure to remind us before your surgery so we can pray. Love your word Cindy! I've got you on my prayer calendar. Praying for you and for your recovery afterwards. God is going before you! I brought coffee... really hot coffee. And hot chocolate. And whipped cream. And marshmallows. And bagels, fresh and warm. It's Blizzard 2018 weekend, Arctic Clipper Cold across half the country and time to write... and pack away ornaments. Grab a bagel and a cuppa... We've got this! Mmmmm, hot chocolate! It is zero degrees here and I have a couple of review posts to schedule. I'm hoping hubby will make a grocery run because we are running low on foodstuffs and he can take the kids too, I certainly wouldn't mind a little solitude. I'll take a bagel too, I'm a carbs addict. I'm assuming you have a very large, very powerful generator to help IF the power goes out, right? But of course it won't because our prayers are all over you for power-ful protection, LOL! Come put away my decorations for me, Ruthy! I'll offer you some warm 31 degree weather to go with it! After a week of freezing temps, we're thawing out today. I discovered our first (hopefully last) busted pipe to one of the cattle water tanks about an hour ago. Water's off and hubby is fixing it. We ran our water lines through our cement slab years ago, so we never have broken water lines to or in the house (praise the Lord), but then my husband tee'd off that line to run water to the cattle pens behind the house. Any time there's a broken water line and I'm not washing clothes, etc., if I hear the faint sound of water running... when there's not supposed to be any water running, then my ears perk up. Yep. I heard water running when the temps rose today. Walked outside and saw a busted pipe in one of the pens. Your hubby is fortunate to have those ears on his side! I pray that things warm up! My hot pipe to the washer didn't work this morning, but everything else is. So grateful. Did I mention the HEAT of the coffee, people???? Thanks for an awesome first week Seekers! Stay warm! Jill, it was a fun first week, wasn't it! 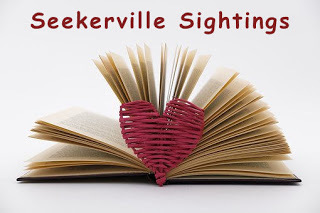 Seekerville, thank you for hosting a FABULOUS NYE PAR-TAY! Thank you for the surprise books. Congratulations to all the winners! Enjoy. Our weather in Texas is warming up nicely! RUTHY, thank you for the hot choccy and yummy treats! Enjoy the warming tree, Caryl! And I hear ya. MS is the same. I actually went outside for a bit. Not long as the wind is still pretty stiff, but SO much warmer than it was in the teens. That party was so much fun! And the weather, oh mylanta... cold is cold is cold! Enjoy getting out of the deep freeze, Jan! I know I say this every year. But I'm always astounded at how big our country is. So many variations in weather. We're in blowing and Arctic cold still, and lake effect snow and -25 wind chill/feels like, whatever the weather folks' current term is. My wood stove can't keep up! Thanks for the coffee Ruthy! It's 5 degrees in Va. this morning and I stayed up way too late reading! I'll see you over at the Café on Thursday for some of that pizza, could I have extra cheese please? Pam Hillman, take me with you! I can't wait to get back to the Natchez Territory, I've had the road to Magnolia Glen bookmarked since Nov! Tracey, the night before last, I stayed up too late reading, too! Last night I was up way late polishing my blog post for Monday. You're welcome, and there's more where that came from... Extra cheese will be available!!!! CONGRATULATIONS winners! Oh isn't it so fun to win books?! We book bloggers forgot to mention (being the newbies that we are) that we have year end favorites and highly anticipated reads posts up! We'd love to have y'all over to share your two cents. Our tbr piles/planets are always growing and we love receiving recommendations nearly as much as we love giving them! Sincerely, the book pushers, the rah-rah readers, the still squealing over being Seekers book bloggers! So, where are these lists? On FB? I love your shout outs for books, authors, Christian fiction and great reads.... A chorus of "You Make Me So Very Happy" is running through my mind right now!!! Congratulations to the winners! Great New Year's Eve party. I'm excited for the new year, and like Cindy said, excited for my one word and where it'll lead- reap. I at first thought it was an inactive word but Sherrinda helped get me straight. And the part I'm focusing on right now is the part of reaping Boaz did in the book of Ruth. He left parts of what he reaped for Ruth, not the leftovers, not the bad parts, but choice pieces she could use. Then the part about reaping where you leave the chaff, the unnecessary behind. That's a focused effort. I can't wait to see where this study leads! Happy weekend! We're supposed to get to a high of 16 today. At least the sun's out, but it's not warm. What happened to when it's cold it should snow? The cold wouldn't be so bad if there was some snow. Reap is a lovely word for 2018! May you reap well and prosper! Thanks for a great WE and congratulations to all of the winners. If this first week in Seekerville is any indication then we are in for a great year. And no, I'm not surprised! Thanks for your kind words, Connie. Let's make this a super year in Seekerville. Aw, thank you! We're not surprised, either... but we are pleased as punch! Bless you, Connie!!!! Congratulations to all the winners of the week and the NYE party! So exciting to see the new year kick off and all changes to Seekerville shine! Have a great weekend everyone. I'm off to Puppy Playtime so the newest addition to the family can bond with 4-legged friends. BTW, Ruthy? I think we're going to be pushing 60 degrees today. I'll bundle up in a blanket anyway, just to offer support to all the folks embraced by the Nor'easter. Thanks for a great first week at the all-new Seekerville. Awesome job! Sounds as if all of Seekerville lives in the blizzardy east! Here in the desert it will be a sunny 72* today. Just saying. Send some warmth to Georgia, Marcia. Please!!! Oh I do miss that warmth! But, now I get to wear all kinds of cute boots and scarves. And truly the snow is amazing. Still...feel free to sends some warmth to Michigan too! I will admit to loving cute boots and scarves!!!! I would like to need them a little less right now. Just a smidge. BUT... I saw an article that talked about northerners living longer.... Hearty, adaptable stock... I'm taking ANY POSITIVE I CAN from this wind chill and -2 degree temperature!!! Congrats to the winners....I am happy to be one! YAY..an E book by one of the newbies here! What a great way to start off 2018. Congratulations to all the winners! And I must add I am totally thrilled to be one! What a great week this was at Seekerville. Thanks for all the hard work! Looking forward to next week and to digging deep into the links! Thanks so much! Have a wonderful weekend! Congrats Kelly! Have a great weekend! Thank you Pam! You are all so amazing! 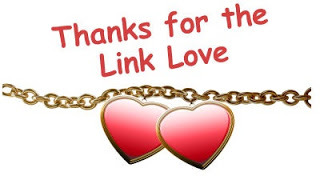 Thank you all for continued dedication to sharing with us all! Happy First Weekending of 2018! It's freezing here too, Ruthy, so I'm gratefully accepting the hot chocolate with whipped cream because why not? This cold snap is supposed to break tomorrow. Hooray! Kav, I've been drinking a lot more hot cocoa during this cold snap than normal. There's just something about really cold weather and hot cocoa that just GOES TOGETHER, isn't there? Atlanta has football fever with the big national championship Monday night. I'm hosting my local writing group that evening, but we'll finish early and head home to catch the second half. Looking forward to next week's lineup. Everyone bundle up and have a great weekend! You, too, Connie. I'm mostly staying inside and writing! Thank you all for the NYE prize! That was such a fun party! Ruthy, I will take a cup of that hot chocolate. I am currently sitting in my car in a cemetery waiting to play Taps at a military funeral. The temperature has risen to a solid zero (from -12 this morning) and the sun is shining so I am hopeful that the trumpet will actually play! A few prayers wouldn’t hurt, though!Days like this make me so thankful for our veterans and active military. Julia, praying for you and your trumpet, that you bless them. Thank you, Pam. The prayers worked! The trumpet played perfectly despite the cold! And if this makes it into a book, I would love to read it! Oh, bless you, Julia! I'm always overcome to hear a bugle play taps and/or a bagpipe to play Amazing Grace... there is something so singularly beautiful about both. It just grabs my heart. God bless that soldier/marine/airman/woman for their service. And thank you for shouldering that task!!! Julie, God bless you for honoring our military heroes! How did you get involved? Are you military? I love programs that honor our veterans! More details, please. I am not military, although a I was born at Ft Bragg while my dad was stationed there. I began echoing Taps almost 20 years ago. I sat next to an 80-something year old veteran in our community summer band and he asked if I would be able to provide echo for him at funerals and programs. When he passed away I continued as bugler. The local vfw and funeral homes call me as needed. I love being able to do this one small thing to say thank you to our vets and their families. Congratulations to all the winners! Great way to kick off the new year! Crazy weekend (so what's new, right?) --still catching up on stuff I got behind on last year, but hope to squeeze in some writing time. AND a walk! YAY! Glynna, are you as cold as we are in the East? I'm making Chicken and Artichoke French for tonight.... a favorite up here and we've got some sweet folks for supper. If they're brave enough to face the cold!!! I'll make plenty so we can all enjoy it! What type of dish is that, Ruthy? The French throws me, but I love chicken and artichokes so I'm headed your way!!! Deb it's probably called something else other places... Thinnish (or pounded) slices of chicken breast are dipped in flour, then beaten egg and lightly browned in olive oil... when they're browned on all sides you add butter, lemon juice and dry sherry. Let it simmer, then put in baking pan, cover and let it finish cooking in the sauce in the oven. Serve with favorite past. Repeat for artichoke hearts but I make sure to halve them and "dry" them before I flour and egg them.... It's delicious and a big family favorite. Oh my, you had me at artichokes. I love them. This recipe sounds delicious Ruthy! Thanks for sharing. Sounds yummy, Ruthy! I have a chicken, artichoke and fresh mushroom dish that sounds similar, but the veggies aren't floured. You're making me hungry! Oh, that sounds so good! But lots of work! Congrats to all the winners and authors! Congratulations to all the winners! Especially to Nicki and Connie on winning a Kindle Fire!! Audra, I'm so sorry I missed your wonderful post Friday. I was in BOA mode. :-( Excited for your new inspiration and series! Janet, I almost did the same thing. Good Sunday to all in Seekerville! Congrats to the winners - the generosity of the Seekers is unmatched. Thank you all! Looking forward to a terrific 2018. Blessings to all! My one word is FOCUS. Working on doing just this, as I make a list and check it twice to discover the WHAT I should be focusing on. ;) HA! Stay warm. Hot water on the stove for tea, coffee or MMMMM, hot chocolate. Congratulations to all winner! Happy reading! Happy weekend! Congrats to the lucky ducks! Happy weekend everyone....and just like that the first week in January is done....sheesh! Stay warm youse guys/gals in cold climates...I would feel like a turkey in the freezer if I lived where you are, brrrrrrrrrr! I'll take my rain and hitting (maybe) 50 degrees any day over that. Ruthy, glad you brought copious amounts of HOT coffee 'cause I could use a good cuppa. Toasted bagel to boot...thanks! Congrats to the winners in the New Year bash, that was a whole lot of fun. Had some great conversations and fellowship...did I mention food? 'Cause there was that too :-) No calories in virtual food, right? Looking forward to another great week here in Seekerville, looks like a wonderful line-up! Trixi, we did have a good time! Happy weekend and congrats to all the winners! Eee! I'm so excited! Thanks, Janet! Starting school again tomorrow. Sigh...Could Christmas Break last forever pleeeaaaase?